Chrionex: My personal fave snake is the Boomslang, a members of the family Colubridae whose members are generally harmless to humans. Yet, the Boomslang has a highly potent hemotoxin slow acting venom, taking hours before any effects are noticed. This can leave victims unaware of their life-threatening condition. If not treated promptly, treatment with anti-venom and a full blood transfusion is required to replace the blood that is now permanently unable to clot. My personal fave snake is the Boomslang, a members of the family Colubridae whose members are generally harmless to humans. 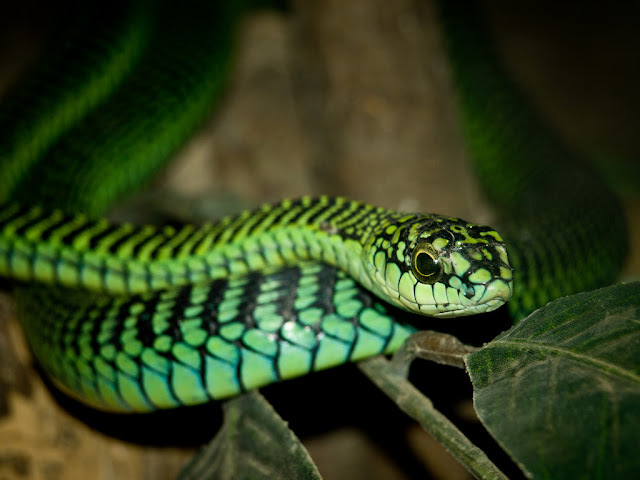 Yet, the Boomslang has a highly potent hemotoxin slow acting venom, taking hours before any effects are noticed. This can leave victims unaware of their life-threatening condition. If not treated promptly, treatment with anti-venom and a full blood transfusion is required to replace the blood that is now permanently unable to clot.